For your writing to transform you and others, you need to be willing to go where it hurts. Writing into your pain feels raw and vulnerable. It feels like you’re exposing yourself to the world. But there is so much power in writing into your pain. When you give your pain a voice, you can take positive action to treat the source of the pain. I’ve been posting on my Instagram account recently. I choose a photo I’ve taken and edited, most of which are of sunrises, sunsets, the sky, and beautiful places. Then I write a little thought or a poem. Today, I felt raw. I ate cookies and cream ice cream straight out of the container, leaning over the kitchen counter, feeling abandoned by my friends. I laid in bed, looking through my photographs, wondering what I could possibly write from this dark, bloated place. And then it occurred to me — I could write through the pain. Instead of creating an inspiring post, I could share my feelings in the moment. I just stood in the kitchen, eating cookies and cream out of the container. I’m in bed now, my body complaining. My back aches from my growing pregnant belly. My stomach feels bloated with swallowed emotion. I wish I could fill myself with love, mother myself, soothe myself like a child. I’m all out of love today. Smooth, sweet, and creamy as a cloud. As soon as I wrote this poem, I felt an opening. Shining the light onto my emotions and actions helped me understand what I was feeling, and instead of curling into a ball on the couch, eating the rest of the ice cream, and watching the newest episode of This is Us, I am here, writing this blog post. When you give your pain a voice, you can see where it is coming from, and instead of drowning it with ice cream or alcohol, you begin to understand how to approach and change your experience. Every time I’ve allowed myself to go there — to put words to a painful memory or emotion — I’ve felt a release. Suddenly my pain shrinks from being a giant monster. Instead, it becomes something tangible, something I can explore. After I wrote that poem, I had the courage to reach out and tell my friends how I felt. Our relationship can now heal. When you give your pain a voice, you allow yourself to heal. When I was in college, I dated a man whose mother suffered from manic-depression. For his entire childhood, he didn’t know what emotions his mom would hit him with each day. As a result, he felt acutely uncomfortable every time I tried to express a strong emotion. Even if the emotion was positive, he seemed unable to deal with it. I learned to hold my feelings inside. Sometimes I felt like they were knives inside of my body, cutting me on their way out. When we broke up, I slowly healed and allowed myself to feel my emotions again. I frequently tell my husband, It’s okay to feel the way you feel. But there’s still this lingering feeling of Just don’t go there. It’s better to be happy. Be positive. Look on the bright side. Even though I’ve encouraged my writing workshop participants to write their tough stories, I often shy away from them. I would rather people see me as a positive person. I would rather see myself as a positive person. How often have you choked down a negative emotion, pushed away a tough story, because you didn’t want to face it? But by ignoring negative emotions and stories, we don’t give ourselves a chance to heal. Instead, our stories become wounds, festering under bandages, without a chance to be exposed to the air and scab over. Giving your pain a voice lets you tell better stories. Let’s face it — without pain, there are no good stories. I volunteer at The Moth every month, and the best stories are the ones that zoom in to the details. When a storyteller is brave enough to own their pain and to give it life with their words, the entire audience can feel their ultimate transformation. The best books and movies always contain pain. Imagine Harry Potter without Voldemort and the Dursleys. Imagine Katniss Everdeen growing up in Minnesota instead of District 12. Imagine Frodo Baggins without the ring. Every great hero has to weather pain and overcome it. Pain sits at the center of all great stories. One of the first steps to writing great stories about your own life is breathing into your pain, giving it words, letting it be seen. When your readers can feel your pain, they can also feel the healing that followed it. Without the pain, your stories lack depth. You don’t let your readers into your world in the same way. Giving your pain a voice allows you to connect with people on a deeper level. Some of the best, most impactful blog posts I’ve read have been about pain. They are the posts I remember years after I read them, because they feel so real and visceral. It’s a relief to read about someone who is struggling and who isn’t afraid to share their struggle. It doesn’t make the writer seem inferior — it makes them seem more real. My friend Rachel used to lead women’s writing workshops in Miami. The women I met in her writing groups are still my closest friends in Miami, because we trusted each other enough to write and share true stories about our lives. Stories about struggle, anguish, pain, happiness, celebration, coming alive. Stories about everything. Each time someone dared to write about a deep pain, there was always a woman in the group who could relate. By the end of our sessions, we all felt so much less alone. 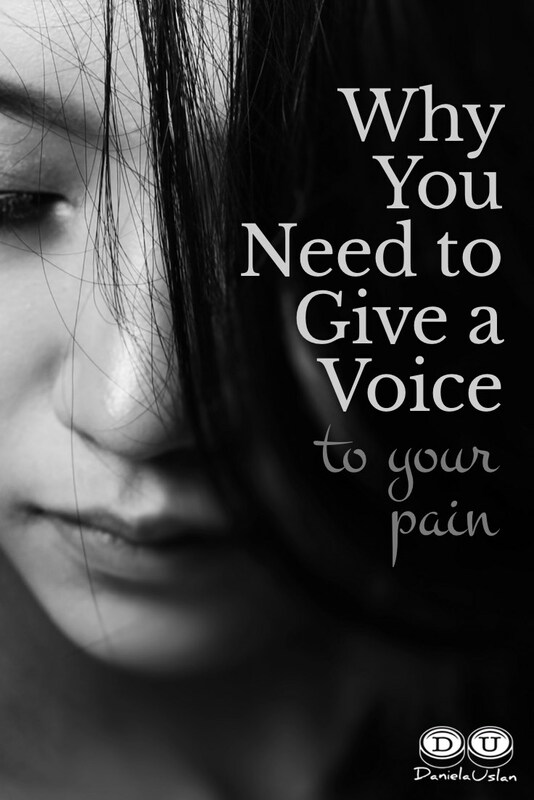 How do you give a voice to your pain? It’s easy for me to write that it’s important to give your pain a voice, but how do you do it? How do you gather your courage and write the tough things? Focus on the concrete details. One way is to ground yourself in the concrete details of your life. At the same time you were feeling pain, things were happening outside your body. Write about those things. My relationship with my college boyfriend was one of the most painful things I’ve ever experienced. But I don’t have to enter that story through the barbed wire of my depression and feelings of inadequacy. Instead, I can write about sitting in my white Nissan Sentra, clutching my sparkly blue phone to my ear, talking to him during his time in Israel. I can capture the slow descent of dusk as I tried to weave the fragments of our conversation into more than it was. Write about what actually happened. I did this when I wrote about the ice cream. I was curled in bed, feeling like I never wanted to move again, and then I was able to come out of myself enough to recount the actual details of what happened. I didn’t write, I just ate my emotions away. Instead, I wrote, I ate cookies and cream ice cream out of the container while leaning over the counter. Writing what actually happened removed the sharp tinge of judgement. Even if you’re writing about something much more painful, recounting the facts will help you approach your pain. But don’t just recount a series of events. Go into each moment. Grab the details. Write about how the experience felt in your body. I was upset when my boyfriend didn’t make time to celebrate my senior project with me. Instead, write about what happened in your body. I couldn’t believe it. My senior project was approved! I ran outside, looking for my boyfriend, but I didn’t see him anywhere. He knew that I would be done and I thought he would be there to celebrate. As I searched around the quad, I felt a warm, heavy feeling creeping in behind my eyes. My shoulders sagged and I dragged myself to his apartment. I could already feel heat rising in my chest as I knocked on his door. Doesn’t that give you a more visceral sense of what happened? Give yourself time to heal if you need it. I broke up with my college boyfriend in 2005, almost 13 years ago. I didn’t write about it until 2014. For years after our relationship ended, I held on to the pain of it, a knotted mass of emotions in my chest. Maybe writing about it earlier would have helped me heal, but I wasn’t ready. Sometimes fresh pain isn’t ready to have a voice yet. You need to heal first, and that’s okay. If you start writing into your pain, and it feels too hard to bear, ease off. You’ll come back to it when you’re ready. The next time you find yourself hunched over a container of ice cream or a 6 pack of beer in an attempt to drown your emotions, I hope you consider writing instead. Write into your pain. Give it a voice. You can only heal the pain that’s been exposed to the light.